Even though vision isn't clear for many months, a newborn baby begins exploring his world with his eyes soon after birth. 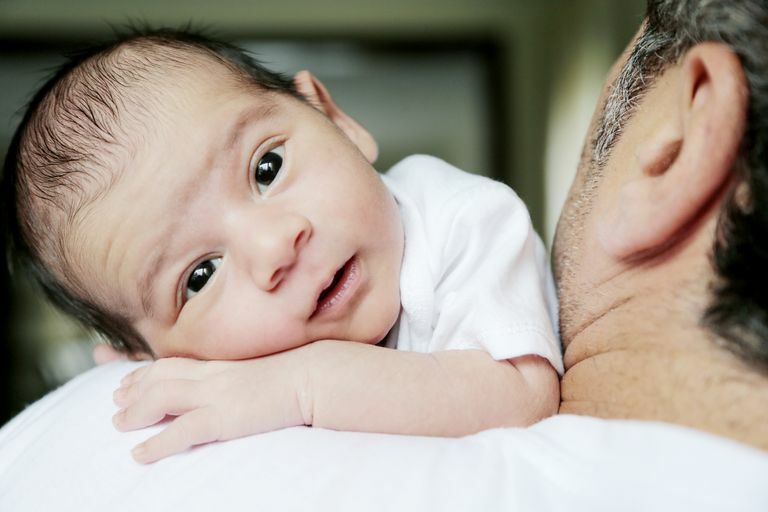 His eyes make seem perfect to you, but problems often arise in the eyes of newborns. The tiny, delicate eyes of a newborn baby need proper care. Be sure to keep your eye out for any problems including watering eyes, crusty eyelids or crossed eyes. Alert your baby's pediatrician to anything that seems out of the ordinary. Following are three common eye conditions often seen in newborn babies. Ophthalmia neonatorum is a type of eye infection or conjunctivitis that newborn babies sometimes develop. In the 1800s, a physician named Carl Crede found that infants were catching ophthalmia neonatorum during vaginal delivery. He discovered that the infections were caused by gonorrhea, a type of sexually transmitted disease. These infections, if left untreated, can cause blindness. The number of cases dropped immediately after he started instilling silver nitrate into newborns eyes right after delivery. Silver nitrate eye instillation can be very painful to a newborn and cause toxic conjunctivitis. In today's medical environment, erythromycin eye ointment is used. Erythromycin ointment instillation is comfortable for the infant and effective at reducing gonococcal infections as well as infections caused by chlamydia. Chlamydia is a more common cause of ophthalmia neonatorum today. If an infection is present in the mother, a baby can also be delivered by Caesarean section surgery (C-section.) to avoid passing the infection on to the baby. However, many people who have chlamydia or gonorrhea do not have any outward symptoms. As a result, one can have an infection and not know it. Some medical facilities give a new parent an explanation and option of having an antibiotic ointment instilled into the babies eyes upon delivery. However, in today's world, there are certain movements that attempt to recommend passing on things such as this done to a newborn baby. There are always risks to weigh when considering medical treatment. If you choose not to do this, be sure to monitor your baby's eyes closely soon after birth for potential eye infections. Newborns begin to produce tears at around three weeks of age. Around this time, watch for excess mucus production or discharge. Some babies are born with blocked tear ducts. A blocked tear duct causes tears to form in the eyes and roll down the cheeks. Sometimes a bacterial infection can develop because the tears do not drain properly. Blocked tear ducts should be evaluated by a pediatrician, as they may require treatment if an infection develops. However, most blocked tear ducts tend to open on their own during the first year of life. Using a soft washcloth or a cotton ball and plain water, you can carefully cleanse your baby’s eyes. Dampen a cloth or cotton ball with a little bit of warm water. With the baby's eyes closed, gently wipe the eyes from the inside to the outside corners. Use a different part of the cloth or a new cotton ball for each eye. If the infection seems more severe or there is significant eyelid swelling, your pediatrician will most likely refer you to a pediatric ophthalmologist for evaluation. If the treatment stated above does not work, your baby may need further evaluation. Another condition that pediatricians and eye doctors look out for in a newborn is a white-looking pupil. Sometimes babies are born with congenital cataracts. A cataract is an opacification or clouding of the eye's natural lens. Normal cataract development occurs as we age and grow into our 6th and 7th decade of life. However, occasionally a baby is born with this opacification. Although not required immediately, cataract surgery is considered very early to avoid permanent vision problems later in life. Another cause of a white pupil is a rare eye cancer called retinoblastoma. Retinoblastoma develops within the retina, the light-sensitive layer in the back of the eye. Retinoblastoma must be treated immediately as it can destroy the eye and sometimes, worse, may spread to other parts of the body. A newborn's eyes are delicate and need tender care as they develop and grow. Keep your baby's eyes and vision healthy by visiting your pediatrician regularly for well visits. Always alert your doctor to anything out of the ordinary.